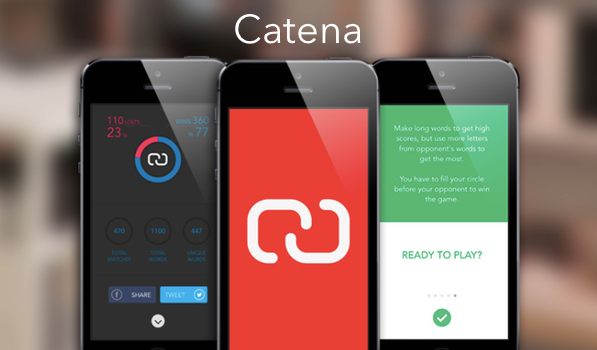 Catena is a beautiful word game for iPhone and iPad that uses a refreshing method to challenge your vocabulary skills. We’ve lauded several word games such as Letterpress, SpellTower and Clever Clues before and each of them has its own unique gameplay style. This is why I’m always amazed when I see a new word game that’s different and still as addictive as the ones I’ve played before. Catena falls in this category and is definitely worth checking out. Catena’s game mechanics are quite simple to understand but the game’s mastery depends on your hold over the English language. The app greets you with a nice tutorial on first launch, which, like the rest of the app uses vivid colours and is very polished. The game can be played in two modes — Single Player or Multiplayer using your Game Center ID. You start the game by choosing your preferred mode and are then taken to the playing screen. The playing screen divides the game into two vertical halves, with your words on one side and your opponent’s words on the other. To play Catena, you need to build a word chain using the last letter(s) of your opponent’s word. You can use multiple letters from your opponent’s word but there are certain stipulations that make the game exciting, especially in multiplayer mode. For example, you cannot use your opponent’s entire word in yours, you cannot use plurals and you also cannot repeat a word that you’ve used before in the game. I love how the app automatically highlights the letters you’ve used from your opponents word using the current colour theme of the app. This makes for a good overview of how the game is proceeding. The game might seem pretty simple but the way you’re awarded points depends on the length of your words and how many chained letters you’re using from your opponent’s word. To win the game you need to complete the circumference of the circle near your Game Center ID, which is drawn a little every time you type out a valid word. Whoever completes the circle first wins the game. I like the little detail here where the face inside the circle changes its expression depending on how you’re performing during a single player game. The game can get really competitive and is a ton of fun. The game’s music is very soothing and quite surprisingly, complements the competitive nature of the game. There’s also a hamburger button in the app that represents a setting menu through which you can turn off the music, access stats, change the theme (via in-app purchase) or even view the tutorial again. The game statistics include values such as the total number of words, unique words and victories you’ve had in your gameplay thus far. You can share these stats on Facebook or Twitter if you so desire. I feel a few things could be done better in Catena; for example, although you can play multiple multiplayer games simultaneously, you can only play one single player game at a time. Swiping to go back in iOS 7 has become natural to me now and unfortunately, you can’t swipe back form the game screen in Catena even though the arrow suggests otherwise. The game syncs statistics across devices quite well using iCloud but does not sync your current games, which is a quite a disappointment. These caveats haven’t prevented me from playing Catena though and it’s getting more addictive by the day. The app is available for Free on the App Store and offers an in-app purchase for unlocking some lovely themes and more challenging game modes.